Based in Silicon Valley, BRYTE Labs is a direct-to-consumer brand that’s sleep technology is built to reunite you the user with your sleep. Chances are when you’re in bed, you’re on your smartphones and tablets, potentially losing out on much-needed rest, so it’s interesting that the company plans on using digital technology in the form of AI to reunite you with proper sleep. The BRYTE bed was developed by John Tompane, with whom I discussed the idea of taking something such as bedding and improving on a product that hasn’t really changed in ages. Inspired by a friends story of their wife’s constant struggles with sleep due to multiple back surgeries John, his brother, and a good friend went to work developing what’s now simply considered the BRYTE Bed. The average human sleeps roughly 6.5 hours per night, however, did you know that 60% of people have a higher risk of injury when they get less than that? Neither did I, until I had the opportunity to check out the BRYTE Bed, which has been described as the world’s first self-learning bed. Featuring up to 100 active coils, dual sides, a heating and cooling system, complete room integration and a meditative wave. Combined with the artificial intelligence of AIDEN, BRYTE’s personal sleep concierge, your bed will learn your preferences as you sleep, without needing additional gadgets dangling from your bed in order to figure out your sleeping patterns. 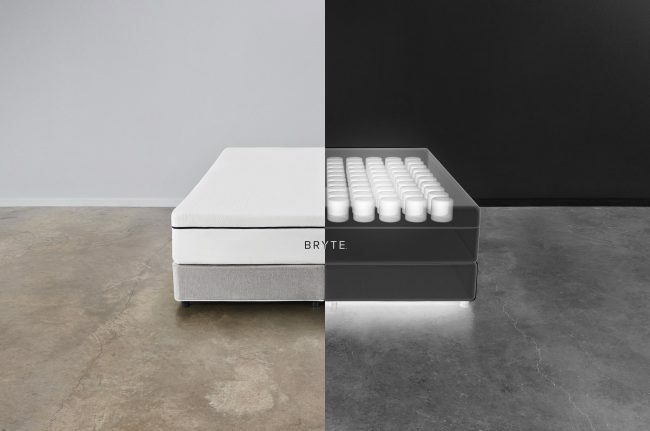 The Bryte Bed starts at $5950 with a monthly subscription of $15 for the Sleep Concierge Service. If you’d like more information about their beds, you can visit Bryte.com.